Once upon a time, we planned on moving to Indonesia. We dreamed of raising kids who learned about the world from being in the world. Even though I hate change, and I hate travel (it’s hard to believe that I wanted to live in another country), I got so excited about my kids moving easily across cultures, speaking second and third languages easily and being at home in the world. God had different plans, and apparently, Indonesia was not a part of those plans – at least not right now. Traveling the world is not logistically or financially feasible at the moment, and I’ve already traveled to Indonesia with a three year-old and a one year-old. Believe you me, it is not something I’d like to repeat until all our kids are older. I was forced to find other ways to raise globally-minded kids. I want my kids to love the world – the whole world, not just the United States, not just the glamorous countries like France and Spain, but the entire globe. As you’ve probably noticed, despite the increased access we have to the world through travel and the internet and technology, there is still so much hate and ignorance and misunderstanding. I want my kids to have deep compassion when they hear about natural disasters in Haiti and terrorist attacks in Iraq and genocides in Syria, compassion that moves them to some kind of action. I want them to think beyond themselves, beyond their own country, beyond their own culture. I want my kids to grow into the kind of people who want to add good things to the world and leave it a better place than when they first came into it. Global-mindedness is defined as “to explore new ideas and perspectives as well as humility to learn and willingness to work with people around the globe” (source). Openness to new ideas begins with knowledge. Our kids might not end world hunger, but they can sponsor a child in Africa, making sure that one child is never hungry. Our kids might not bring about world peace, but they can vote for politicians who can. Our kids might not guarantee fresh water for the whole world, but they can help dig a well for one small village in Ecuador. Our kids might not change everyone’s negative perception of Muslims, but they can help one close friend see the beauty in Middle Eastern culture. Related Content: What if my Child Never Changes the World? When you can’t afford to travel, raising kids whose heart beats for a hurting world starts at home. So much goes into raising a globally-minded child: it’s how we spend our money, our time, the kind of conversations we have, the way we talk about the world. All of those things are complex and subtle and matter a whole lot more as a child enters the teen years. But little kids? They’re tactile creatures who take in the world with their five senses. Sight and touch are the primary way young children gather information about the world around them, so the things we have in our home matter. The home they grow up in will forever impact their definition of “normal”. If we want to raise globally-minded kids, we need to be intentional about their physical environment from an early age. As a family, we have intentionally chosen home decor, books, toys and games to clearly communicate one message: this family loves the world. I sincerely believe that simple, physical objects like globes and maps show our kids that we think beyond America and that we care about what happens across the ocean. They may not understand what you’re getting at when they’re four years-old, but these simple tools lay the foundation for the doing and the giving and the talking that comes later on. These things don’t need to cost a fortune. Many of them are pretty affordable online, or you can find them at a thrift store or yard sale. I hope they help you in your desire to raise globally-minded kids. Because raising kids who change the world starts with raising kids who love the world. If you ever find yourself in the library wondering which books are the “good books, you will love this book. Instead of spending a fortune (money and space) to stock your home library, use this book to better utilize the public library – an amazing resource and gift. Friends who live overseas are jealous of our libraries! We own this globe, and my kids love running their hands over the raised surfaces. The raised topography helps them understand what landscapes are like around the world because they can see and feel exactly where the different mountain ranges are. A globe also makes it easy to explain the equator, give them a visual understanding of the planets and orbits and so much more. This map is hanging in our kitchen above the table. The only disadvantage has been preventing kids from climbing on the table, eager to point to their favorite countries. Geographic puzzles are a great way to connect kids’ hearts to the world. Any time you can partner multiple senses in learning is a win! These puzzles are on our wish list this year. The Melissa and Doug United States puzzle has been such an amazing tool for our learning this year (my three year old can recognize multiple states by shape!). I know this puzzle (and others from Geotoys) will help us learn the rest of the world by heart, too. 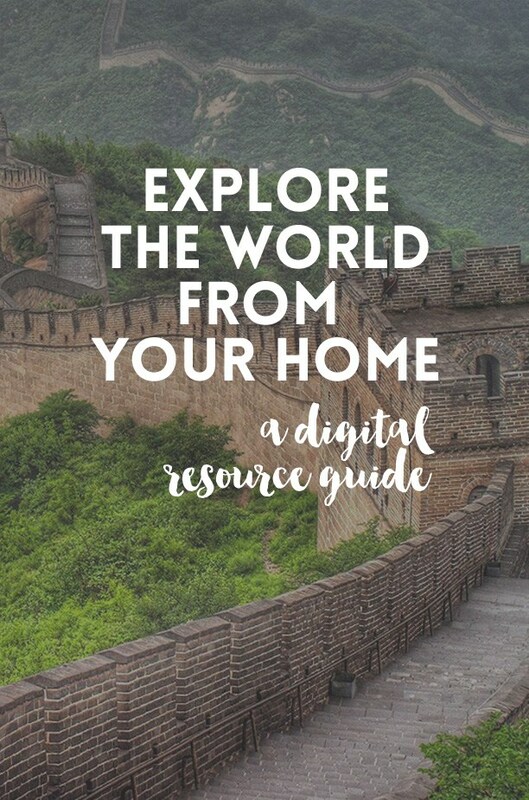 Because we cannot afford to travel right now (nor do we want to with kids this young), I decided to purchase this course from Intentional Homeschooling to guide our study of the world this year. It is such a rich resource! Chantel has book lists, video tours, video guides, and more for multiple countries with new ones being added regularly. We have already sampled France (my daughter’s favorite country) and look forward to diving into several others this school year. If you are a Christian, Operation World is a must-have resource for raising globally-minded kids and communicating God’s heart for the nations. It includes geographic, economic, and political information about each country. It also sparks discussions about different world religions, beliefs, and cultures. We will be using it in conjunction with Explore the World from Your Home to integrate specific prayer into our geography studies. Even though we are fairly relaxed homeschoolers, I strongly believe that knowledge of history is an incredibly important part of a good education. How can we raise globally-minded kids without them understand the full scope of human history? I distinctly remember multiple “ah-ha” moments throughout my history studies growing up where I realized, “Wow, that’s why this country is the way it is.” Or, “I finally understand why this people group did that.” Knowledge leads to understanding and understanding leads to compassion. While this text is best known as a curriculum for homeschoolers, I have heard about families who choose traditional school that also use and love The Story of the World. We also have the audio book companion, freeing me up to keep rambunctious little boys occupied while my older kids listen and color the corresponding pictures and maps. 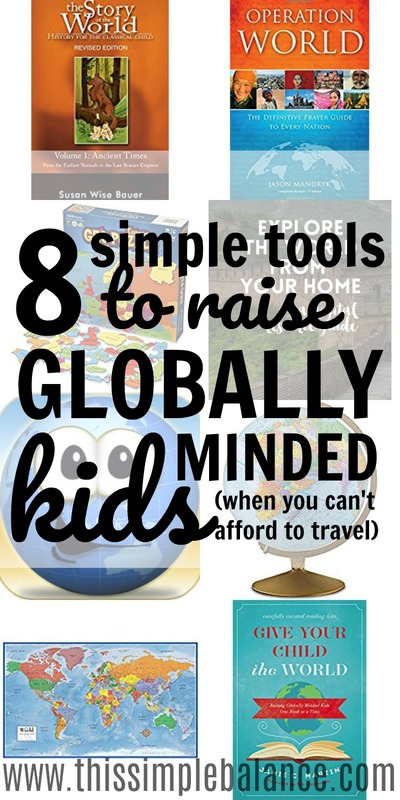 Stack the Countries is another fun tool to familiarize your kids with the world. The app has various features that you can turn on or off. You can have it quiz your kids on various landmarks, capitals, flags, and more. My kids are at the basic stage now, but they LOVE it. They beg to play, and it’s an educational game I can let them play guilt-free. 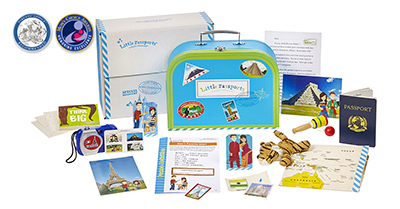 Little Passports is a monthly subscription service that helps your children explore the world, one country a month. You receive a delivery each month filled with information and items that facilitate learning about the country of the month. You can sign up for one month at a time, six months, or a whole year. Great post! We love SOTW too. Especially, the first two volumes. Yes – Story of the World is awesome! Thought we tried the audio books for about one minute and couldnt stand his reading. So it’s ALL mom, which is probably good because with this many kiddos there are plenty of interruptions!